Leader: "Why Jews Everywhere Should be Helping Egypt's Christians"
And they didn't just pray. Their sincere concern for the wellbeing of Israel manifested itself in action. They donated tens of thousands of dollars to build bomb shelters all across Israel to help protect us. "It is our honor to use our money to provide protection to Israelis from terrorist rocket fire. Buying a new car, renovating my kitchen or doing anything else for myself wouldn't give me nearly as much joy and fulfillment," the pastor told me. I left his house feeling awed and inspired. "I hope that my people would help Christians in their time of need, as they have done for us," I thought. Truth be told, on the whole, we as a people have done an excellent job in raising awareness among our children and our communities about the importance of tikkun olam (repairing the world), of reaching out and supporting worthy causes beyond those that directly affect Jews. At almost every rally and peaceful protest, you can see an Israeli flag, the Star of David or another identifier of Jewish presence. We are helping Syrian refugees, standing up for women's rights and volunteering in the world's poorest countries, just to name a few causes we champion. Helping others who suffer from persecution, injustice or discrimination is a hallmark of the Jewish community, and I am proud of that. But at the same time, there are cries that have gone unheard, such as those of the Christians being systematically persecuted—and slaughtered—across the Middle East. Coptic Christians, an indigenous population of Egypt dating back to the 1st century A.D., hundreds of years before Muslims even came on the scene, have been especially targeted. They represent almost 10 percent of Egypt's population and are being persecuted by Islamic terrorists. At least 28 Coptic Christians, including many children, were ambushed and murdered May 26 as they traveled by bus to a monastery. 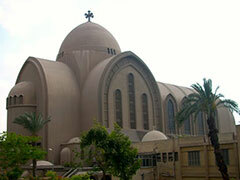 Two terror attacks hit crowded Coptic churches April 10, killing at least 44 people. Since January 2017, more than 100 Copts have been targeted, murdered and systematically threatened. In response to this horrific campaign of terror, I am astounded that the Jewish community has remained virtually silent. The Jewish community and Israel currently enjoy unprecedented, historic support from the Christian community. Christians are our loudest defenders in the political arena, our most vocal supporters on social media and our greatest contributors when it comes to charitable causes. The annual budget of the International Fellowship of Christians and Jews (The Fellowship) is $150 million, which is distributed to 1.4 million Jews in need in Israel and around the world. These funds are sacrificially donated by hundreds of thousands of Christian donors in the U.S. and worldwide. Moreover, Christians make up more than half of the tourists who come to Israel annually, significantly bolstering the Jewish state's economy and morale. In a time when the Christian community has been Israel's staunchest supporter for the past half century, it is shocking that we are the only Jewish organization taking tangible steps to give them aid, support and protection. I implore you to join us in this effort. Do something—anything—to raise awareness about and to alleviate the suffering of Coptic Christians, and Christians across the Middle East. As Jews, it is our sacred duty. As human beings, it is our natural obligation. As past victims of such hatred, it is our people's commitment. As current beneficiaries of Christian support, it is an act of humble gratitude. It is time for Jewish communities around the world to give back to the Christian community, which has given us so much. NOTE: Yael Eckstein is the senior vice president of the International Fellowship of Christians and Jews (The Fellowship). She is the daughter of Rabbi Yechiel Eckstein, The Fellowship's founder and president.